Years of watching episodes of "Soko Ga Shiritai" have left a lot of people with onsen, or hot spring, lust. At last month's First Friday event, I was talking travel with one of those boundlessly optimistic 20-somethings for whom anything and everything is still possible. "Wouldn't it be great if we had an onsen here?" he blurted. Cost: $15 to $18 per person for lunch; $40 to $60 for dinner for two. BYOB. The big "but" is that there are no natural hot springs here, and the closest we could get is to build an artificial pool over some hot-air-spewing vent at Hawaii Volcanoes National Park. Then, if the hot water doesn't cause you to pass out, the sulfuric gas surely will. If you adhere to the glass-half-full philosophy of life, though, the next best thing has happened, with the opening of Hakkei on Young Street, a restaurant that respects the roots of onsen-ryokan (hot spring inn) tradition, elevates humble ingredients and, in so doing, honors its guests. It's the best restaurant to appear since Town opened in Kaimuki last spring, though the two are worlds apart in style. While Town is thoroughly modern, Hakkei has an ancient soul. Much ado has been made over Grand Hotel Hakkei chef Seiya Masahara's victory over "Iron Chef" Masaharu Morimoto in Japan. Some critics of Masahara in Japan raised the point that comparing fusion and traditional cooking is like comparing apples and oranges and shouldn't be done. While there is much to be said for progress, there is a richness and depth to folk cuisines that is unmistakable, and unfortunately increasingly hard to find. 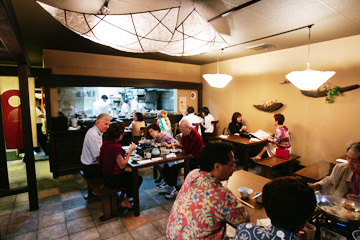 Masahara's protégé, Koji Kuwa, oversees Hakkei-Hawaii's kitchen. Kuwa's work provides a multisensory treat, beginning with the scent of steaming pots of oden that greet the hungry diner. Breathe in, exhale and you will feel immediately transported to a relaxing onsen. The rustic-style, wood-beam interior is somewhat reminiscent of Izakaya Nonbei. Recent foul weather adds to the ambience, giving diners the feeling of finding a sheltering retreat. Seating is limited to about 25, so good luck getting a reservation. But once you're in, it really is like being a guest at an inn. Without the constant ebb and flow of customers, you are given individual attention, so that the seasonal dishes -- no matter how scattershot your approach to ordering -- arrive one by one in a sensible and timely matter, at the point of perfection. "Iron Chef" champ Seiya Masahara, left, visiting from Japan, and resident chef Koji Kuwa are seen at work in the Hakkei kitchen, which is visible from the dining room. 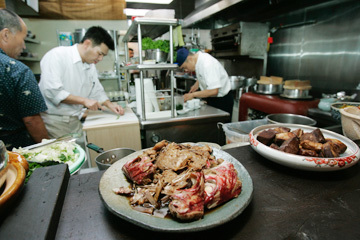 On the counter are platefuls of Tai no Ara-Breem, left, and Buta Kakuni-Pork. Individual servings are much smaller. YOU COULD spend several minutes poring over the menu, which requires superior decision-making skills. It's depressing to think of all the dishes you're passing up when you make a selection. The easy, no-brainer route is to choose set menus running $35 to $60 per person. But the set menus are loaded with udon and oden, Hakkei's famous hot-pot stew, offering only a limited view of the restaurant's capabilities. Just as at an izakaya, many small dishes comprise a meal, so prices can add up. They generally run $4 to $7.60 for a sushi-size offering. As small as the dishes are, they are thoroughly satisfying in their simplicity and purity. That human beings are sometimes said to eat with their eyes is obvious the moment you spot the oden simmering beside a dining counter. Ingredients are fished from the stock of soy sauce, bonito and mackerel for a price: $3.20 per chicken dumpling, shrimp dumpling or beef tendon; $2.20 per piece of deep-fried tofu or potato. It can add up, but having split a bowl of oden with just a few ingredients, you don't need a lot to warm your body and spirit. I loved every bit of the chopped shrimp dumplings, tofu and pumpkin-and-cheese bundle rolled in cabbage and tied with a ribbon of konnyaku. Adding to the feeling of comfort was a cup of the steamed egg custard chawanmushi ($5.70), with shrimp and spinach. I sampled tai (breem or snapper) two ways: grilled and topped with grated daikon and bonito-infused vinegar ($11.40), and lightly simmered ($9.50) in soy sauce, sake and mirin, resulting in sashimi consistency, served with a relish of onions, bell peppers and other vegetables, plus one nod to Hawaii in a sprinkling of macadamia nuts. The restaurant has room for only 25 diners, which allows for attentive service. These were fine, but for a review's sake it's always good to look for the treasures. I found these in manager Masao Kawamura's recommendation of nothing more complicated than dashimaki tamago, or rolled egg omelet served in a pool of dashi ($5.70), and nankin manju ($7.60), simmered pumpkin breaded with pearls of arare and deep-fried. Only two little morsels are offered, so this is one dish that might lead you to order seconds. In Japan the seemingly simple egg dish is the measure of a chef. It calls for patience, timing and skill to fold layer upon layer of scrambled egg in a skillet into a tight, pure yellow bundle, without any of the laciness or browning that comes with overcooking. This dashimaki tamago was perfect. I at first shied away from the buta kakuni ($9.50), pork simmered in a soy-based sauce, just because imagining heavy, local-style soy chicken and teriyaki makes me cringe. But of course I should have figured that is not what Hakkei is all about. In the chef's light touch and ability to capture the essence of pure ingredients without overpowering them, Hakkei demonstrates how far local Japanese cuisine has strayed from its aesthetic roots and deference to nature. There is real beauty and grace in the ability to present a turnip that tastes like a turnip and maintain the crisp texture of snow-white yamaimo, or mountain potato, without burying them alive in a vat of soy sauce, salt and fat, which passes for cooking at too many homes and restaurants these days.